The fares below are per person and quoted in New Taiwan Dollars NTD. They are not valid during high season or holidays such as Chinese New Year, Labour Day or Christmas...... and are subject to change without notice. The tropical island of Boracay is one of the most popular travel destinations in the Philippines which attracts thousands of travelers every year. Boracay Island is located in Aklan province which is 345 kms.south of Manila. 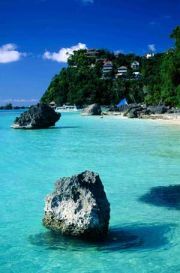 Boracay Philippines is a beautiful small island 7 kilometer long and 1 kilometer wide at its narrowest point. Boracay is surrounded by coral reefs and is well known for its 4 kilometer "White Sand Beach", also known as the Long Beach. The beach is located on the West Coast between the villages of Balabag and Angol, and has been claimed to be the "Finest Beach of all Asia". The water is shallow with a fine white sandy beach with amazing sunsets to be remembered. You can also choose from Yapak Beach, with its white shells, and the romantic secluded Balinghai Beach. Off the beaches enjoyable restaurants, appealing shopping and The Boracay Butterfly Garden all provide tempting diversions. Boracay is made up of three communities: Yapak in the north, Balabag in the middle, and Manoc-manoc in the south. There are about 350 beach hotel resorts with more than 2000 rooms to suit almost anyone's taste. Hilly elevations up to 100 meters above sea level characterize Yapak and Manoc-manoc. Intertwining trails link the small three villages together yet sometimes lead to a lush tropical jungles. Once on the island of Boracay you will find out that getting around is easy and simple. There are three types of transportation, motorized tricycles and pedicabs shared with other passengers, individually rented motorbikes and bicycles, and shuttle services offered by some hotel. Taxi's are not available however, since everything in Boracay is within walking distance. You will most likely join the majority of other visitors moving around Boracay Island on foot. Reserve today as seats are limited ! Please note that a minimum 400 pesos service fee per person is required for your local guide. A NT 12,000 deposit required to reserve your seat.